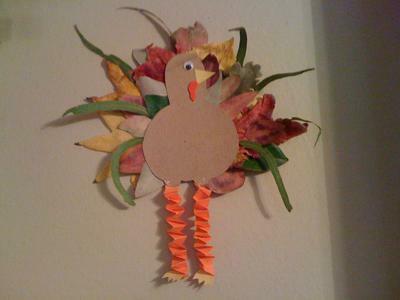 Our gallery of kids craft projects are a real koooool collection. We appreciate all the hard work put into the pictures, paper masks, and mobiles that we want to make this page our official KoolKidsCrafts Photo Show. So here they are with the latest to the oldest. Click the pictures to enlarge them! 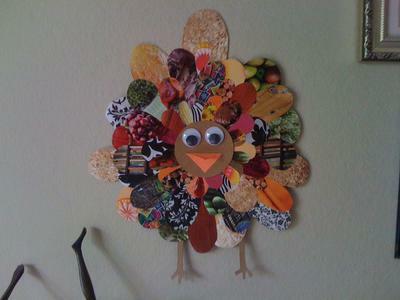 Turkey 1: This turkey was made from a cereal box and magazines. All the feathers were cut from the pages of one magazine. Body and feet were cut from the cardboard of a cereal box. 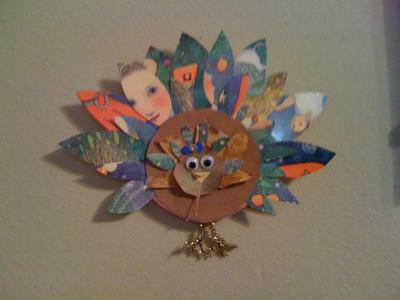 Turkey 2: Turkey craft made from recycled greeting cards and the box from a 12 pack of soda. Also used leaves collected by my little artists. Turkey 3: Collected leaves outside and used as feathers for this adorable turkey. Turkey 4: This turkey was using decorative cupcake toothpicks and a foam head. Quick and easy and good way to recycle the Halloween pumpkins. How very creative Shannon! The birds are bright and cheerful and I like the idea of using old cards. That gives me an idea of what to use mine for. I still have my wedding cards so I will be thinking how I can use them to make something wonderful to give to my hubby next anniversary. It`s a shame you didn`t send these in last month before the 14th. Thank you for your post! 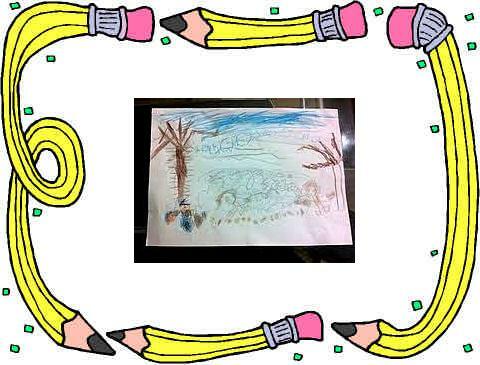 Bethuel said, "I made this collage with the use of pastel, crayons, pencil and pen. Thank you for letting me join on your site and post my artwork. I enjoy drawing and making abstracts especially animals and nature. It is one way of expressing my appreciation for Jehovah's creation. Thank you and good day." That`s a lovely expression, and well done Bethuel! 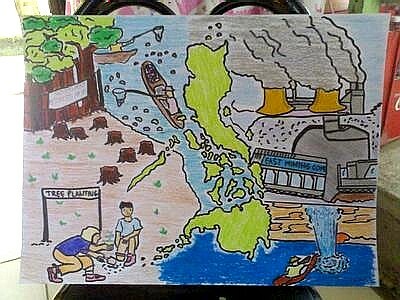 I like how you have the Philippine map as the focal point of your drawing and then filled the white space with sketches of bad environmental management. Using 4 drawing medias is quite interesting and fresh. 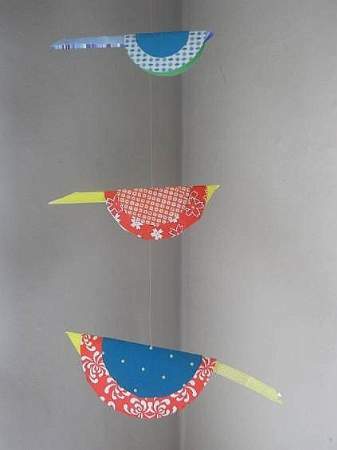 Claire sent this delightful bird mobile as a gift all the way from Kalispel, Montana. USA. I love it and it goes well with my blinds in the craft room. Thank you! 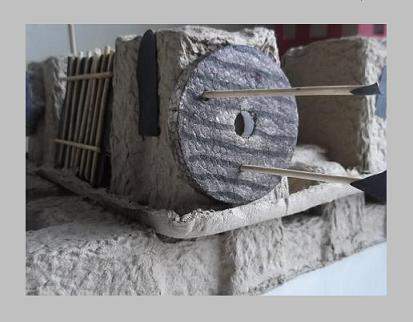 Never throw packaging away until you`ve thought how you could use it for kids craft projects. 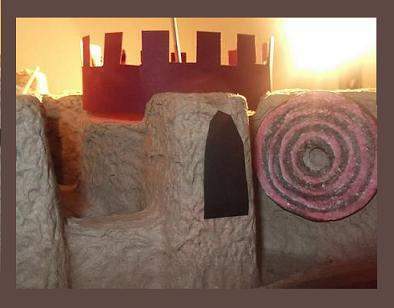 Look at what the KKC crew came up with when they decided to go back to Medieval times. You could almost picture yourself there clad in armor, weary after the battle! What a fantastic flying fish mobile Claire! 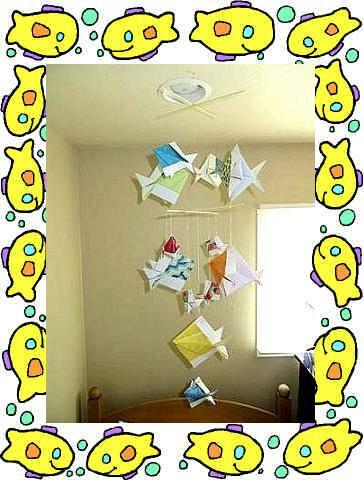 It looks great hanging there in your room. It must be like sleeping in a fish tank dreaming your swimming about with a bunch of deep sea friends. Blub blub! I admire the way you have used different colors and sizes of paper and balanced it perfectly. 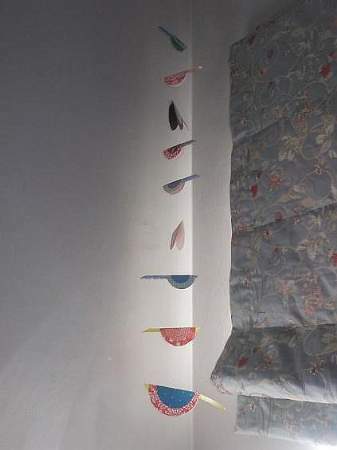 Making this 2 tier mobile was a big task but you mastered it. I love paper too, and love it even more when it is in motion with moving air, be it a mobile, pinwheel, or kite. 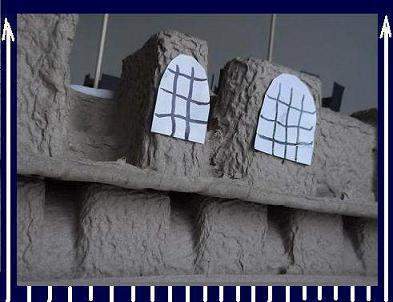 I am happy that you like our kids crafts projects here on Kool Kids Crafts. Did you know that most of them are our own brainwave ideas? 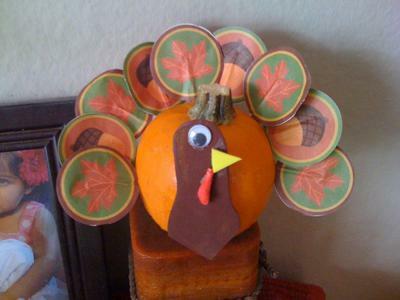 We`re looking forward to seeing more of your crafty work. Keep it up! Winter Wind and Snow. I thought about winter and how the leaves blow about and wanted to make my picture full of action. I also put in a little color but not much because the snow makes everything white. I like winter because I can play with friends making snowballs and a snowman in the snow. The leaves fall from the trees in winter and I get to wear my warm gloves because it`s cold. When it`s winter and it`s really cold, in school I get to do P.E indoors. Gem: P.E. stands for Physical Exercise. Adam your picture is very interesting! I like how you have drawn the motion of wind and the leaves swirling at the bottom. Even the clouds look as if they are moving along. Well done! A super little Spirograph ruler is on its way to your door or your efforts to join in our Winter kids craft projects! My picture is made of cotton, wool colored card and chalk. 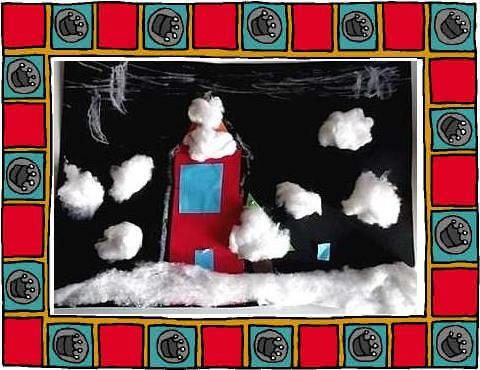 First I made a fir tree then a house, then a small tree, and made snow with cotton wool. I thought of it because winter is a fun holday and it`s fun throwing snow balls and making snow angels and it was a night scene. 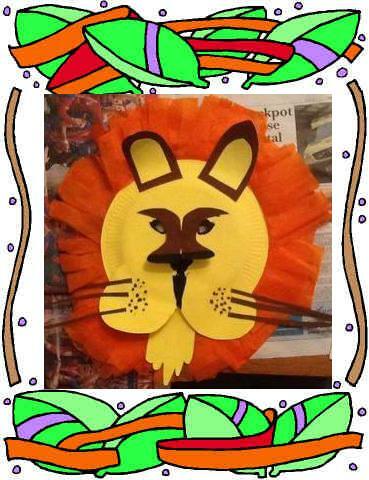 Kool kids crafts are fun because it has lots of activities. My name is James Wedderburn. My picture is made from black card, cotton wool, colored paper, and chalk. 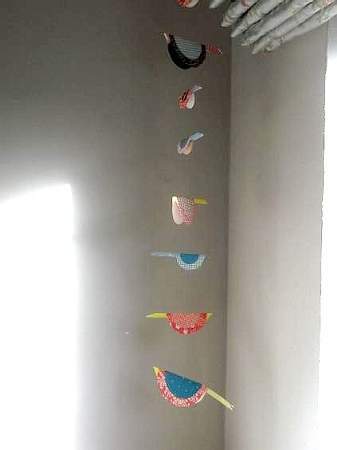 First, I cut shapes from colored paper and stuck 1 piece for the house and another piece for the roof. It was in the night. I am pleased with my picture, yes! I love winter and making a snowman. It was a great winter! Iain and James. Your pictures are lovely. 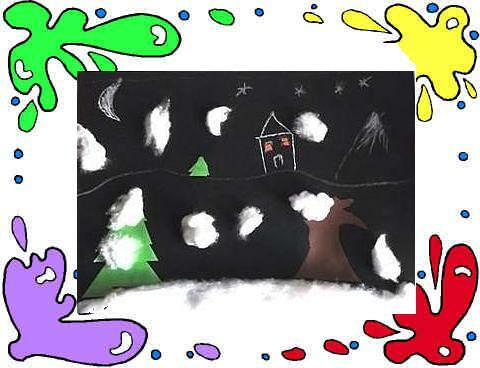 I like how you have used your imagination to make your picture a snowy night scene. The cotton wool gives it a nice soft look, just like you get when real snow falls. I also like the warm welcoming light coming from the windows of the houses. You have earned yourselves 2 Spirograph rulers. Have fun! We look forward to lots more kids craft projects from the KKC crew here. My son has a school project. He's currently learning about animals in the juggle. He worked really hard putting this together sticking and painting all through the day. This is one super lion mask! You would make a great KKC crew member. I am impressed and I think I speak for all the visitors who will see it on this page. Well done! Let your friends know about your page here and your teacher too! I will be posting a Spirograph ruler for you! Here are all your friends and family`s comments. They love it! Beautiful mask, just like you !!! How cool are you Rainé. I wouldn't be surprised if it was mistaken for a real lion. Fabulous, keep up the hard work. Your creative skills and ability will create opportunities for you. Watch and see!!!! Hi raine, what a great mask you have made. I hope when you have time you can make me one so I can be a lion too! The thing is my head is soooo big you may need to make mine an elephant mask!! Raine..This is a super fantastic work!! Indeed a genius in the making! I predict that it could be nominated for an award in your school!! Can't wait to see more of your work!! Shalom! Great job Raine! Tell mummy to bring the mask in for her colleagues at work!